After Dark Piano Favorites, no less. My kind of easy listening, and I love the wide, lush Somerset/Stereo-Fidelity stereo, but something about the title confuses me: "Omantic" Piano? What's that? A make? Reference to a country? What? Wait a minute.... Maybe there was a letter in the torn upper-left portion of the cover. Hm. Looks like part of a... K? No, no, an R. An R. Hm. I got it! "Romantic" Piano!! Whew. Glad I figured that one out. Minus the magic of MAGIX, this would be a collection of clicks and pops, with some music on top of it. The filters on my MAGIX software mostly took care of that, though I had to do some very precise track splicing--twice at the very start of the last track. There's something about doing two quick fade-ins and -outs in a section that lasts 1/20 or so of a second. And I used the click pencil. You don't have to worry about these things--just enjoy a VG-- disc that sounds M-, and enjoy the excellent playing of Pietro Dero, assuming that is/was his actual moniker. Well worth the listen, even if the campy suggest would suggest otherwise. Click here to hear: Romantic Piano--Pietro Dero and His Orch. Yes, 24 "Top Hits"--actually, two 12 Top Hits LPs. You'll notice that both have the same label and catalog number--Tops L1510--but sport different tracks. You may notice in addition that the second LP (which I've numbered 3 on the zip file) features the exact same Mary Tyler Moore (?) photo from two posts ago, with a different track line-up (in the reusable white rectangle). How to tell these things apart, then, issue-wise? My best guess would be the numbers that appear on the L1510 labels--e.g., L1510-A-8 and L1510 B-7 on the first disc above. Meanwhile, we see "A8" on the front cover track listing. On the second LP above, we see 1510-G. This doesn't suggest a consistent system of cataloging on Tops' part, and I don't even know if these digits and letters actually tell us where a given L1510 falls in the L1510 catalog. And you thought record collecting was a piece of cake. There may be some way of determining in what order these things were released, and I may figure it out sometime. And I just noticed that the torn label on the second LP is a paste-over--we can see part of the originally printed track listing where the tear occurs. Cheap labels took great pride in product quality. These fake versions of then-current hits are a lot of fun and well worth listening to--even the misfires are entertaining, if only because the duds tend to be fascinatingly off the mark. I'm thinking mainly of Peggy Sue and Great Balls of Fire, and maybe Rock-a-Billy, the last title featuring a singer who was no Guy Mitchell. And the Peggy Sue vocalist's attempts to emulate Buddy Holly's style have me wondering why even a five-cent label would considering keeping the take. However, the rest of the tracks range in quality from pretty good to astonishing so (Waitin' in School, At the Hop, The Stroll, Almost Paradise). Get a Job is an amazing track, too, if only because the vocalists (The Toppers, yet again) were able to keep up with the tempo. Slowed down a little, this would have been a terrific cover. Come Go with Me is a let-down, though no disaster. Dark Moon is quite affecting, though I haven't heard the Bonnie Guitar or Gale Storm originals for comparison. It's certainly done with unusual care for a cheap knock-off. A cool thrift find on the Crown label. Not in the best condition, but I did my usual obsessive de-clicking (most of it with MAGIX's "Draw Wave Shape" tool, which allows the user to manually remove clicks and pops), so it sounds pretty good. Time-consuming, and I could have simply left in the noise, but I'm obsessive. What can I say? And I'd rather restore a 50-cent copy than buy one on eBay for $18 plus postage (the lone copy presently at the joint). And given the wildly inaccurate vinyl grading that happens at eBay, how do I know I'd get a better copy? I just tossed out a "near mint" copy of a 12 Top Hits disc so littered with scratches, I gave up trying to restore it. The dealer has 100 percent positive feedback, somehow, despite his or her inability to see long and deep tone-arm trails on a vinyl surface. Astounding. Apparently, it takes a specialized eye to spot such things, and a specialized knowledge of playback to know that long scratches produce noise. I don't bother contacting dealers about small-ticket items, since I'd end up spending more to return a disc than I paid for it. There's always the chance of a refund (vice return), but buying records on eBay is a roll of the dice, and when I get a lemon, I simply avoid the dealer from then on. So there. But this is a thrift, not an eBay, buy, and being a person with the remarkable ability to actually see marks on a record surface, I knew right off this would be a MAGIX workout. 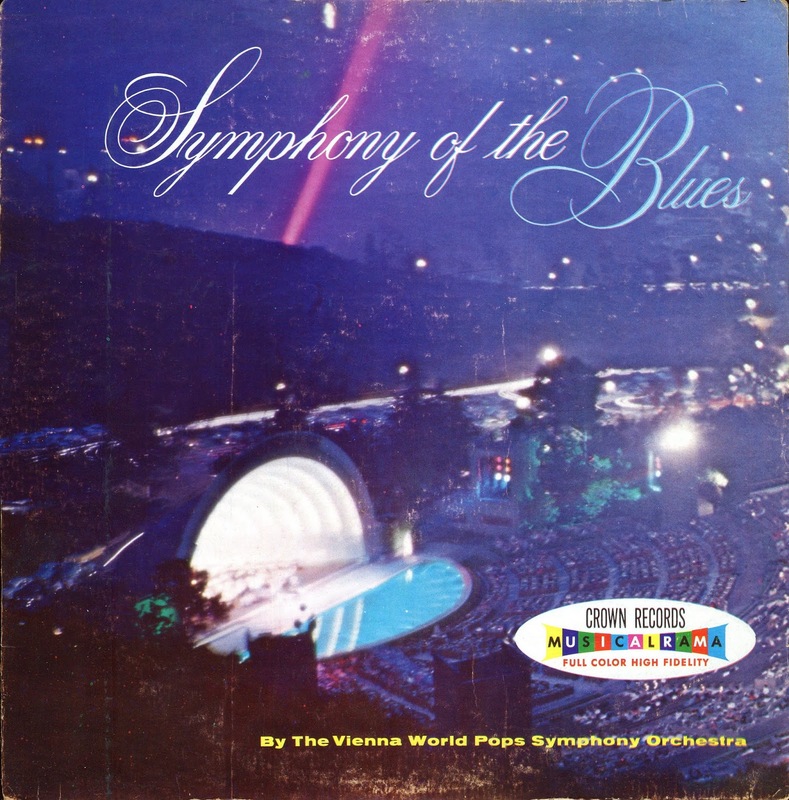 The Vienna World Pops Symphony Orch. (doesn't that sound completely made up, and badly?) is directed by Hans Hagen, who is a professor of computer science at the University of Kaiserslautern in, of course, Germany. No, wait--that can't be the same guy. Let's see--Hans Hagen Homes? No, no. Okay, here we are: Hans Hagen. He looks a little like Danny Kaye in the picture. How did he end up on Crown, I wonder? I mean, this guy was on some genuine labels. Amazingly, all but one of these are actual Tin Pan Alley classics, meaning royalties had to be paid. Highly atypical for a junk label (save for the "Top Hits" type of collections). Unless it skipped the royalties-paying part. I love the music on this disc. Love the cover, too, despite the cheapjack photo quality. (I'm assuming it's a professionally done pic badly reproduced.) Very 101 Strings but less gimmicky. Pretty much what we'd expect from Pops renditions of blues (and "blues"-in-the-title) numbers, but with terrific stereo sound and highly competent arranging and playing. A pleasant surprise. Should be an apostrophe after "Nothin" in the sixth title, but I'm repeating Crown's typo. Proper archiving and all. 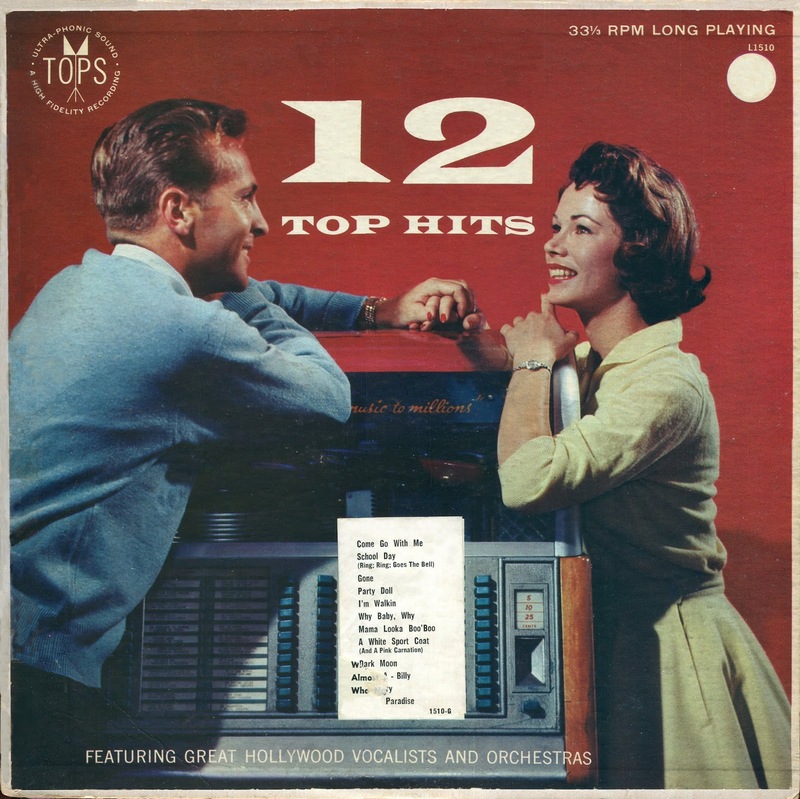 From the Tops label, twelve fun cover versions of current (1958) hits, and I'm almost sure that's Mary Tyler Moore on the cover, but I'm trying to confirm this on line in case I'm wrong. She appeared on some other Tops jackets, anyway. Sure looks like her. 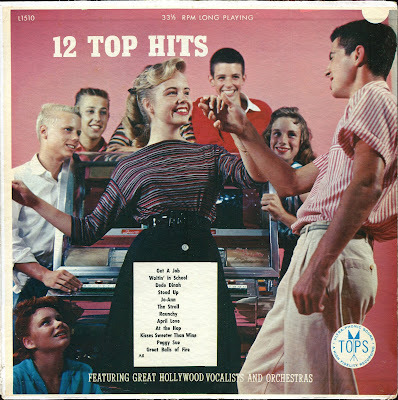 This particular cover photo was reused several times in the 12 Top Hits series, each one bearing the same catalog number (1510) but with different track listings in the handy white rectangle. These cheapo labels always went the path of least labor. Well, this isn't listed anywhere as being one of Mary's LP jackets, but I could swear it's her. The hair, the big teeth.... Then again, her eyebrow mascara isn't thick, as in the other Tops MTM jackets. 'Tis a mystery. I could swear it's her. Some flat singing (as in the interval) on Everybody Loves a Lover, and some all-around-the-pitch singing on Fever, plus some awful harmonizing on Just a Dream (though the Jimmy Clanton original had pretty off-key backing vocals). The rest of the tracks, however, are well done, or at least better. The copy-cat tracks on Tops were pretty hit or miss, ranging all the way from memorable to ouch! And, speaking of Fever, somewhere Merv Griffin claimed he was offered the song but passed, and then Peggy Lee got it. God's honest truth. But, of course, I can find no confirmation on line. This is not my night for on line confirmation. I do know that Merv made a Fever-style number in 1963 called Hey Pretty Baby (Cameo 266). Best track? By far, Scott Otis' Hard Headed Woman. Not sure there was an actual "Scott Otis"--probably not. This version is familiar, showing up on (among other cheapie collections) the Halo label Tops in Pops series. Why was Tops trading tracks with the Record Corporation of America? Or was there a common source for both labels? Questions like this keep me up at night. 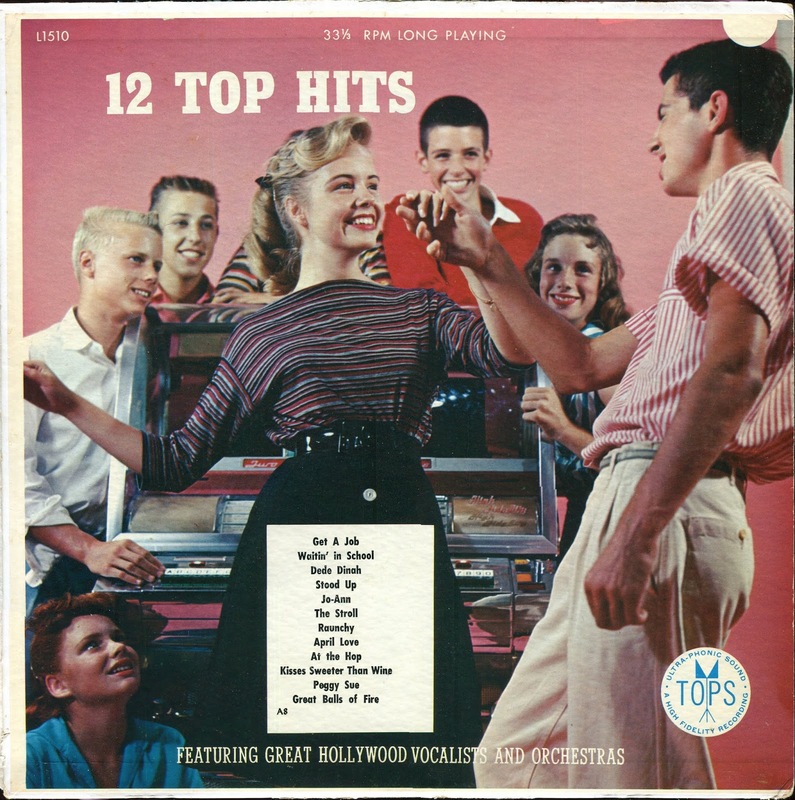 12 Top Hits (Tops L1510, probably 1958), featuring great Hollywood vocalists and orchestras. I found this during a recent thrift visit--the cover was too cool to pass on. Disc is in solid shape, so I gave it a spin and decided it merits a post. This is beautifully arranged and performed mood music/easy listening, perfect for background sounds. 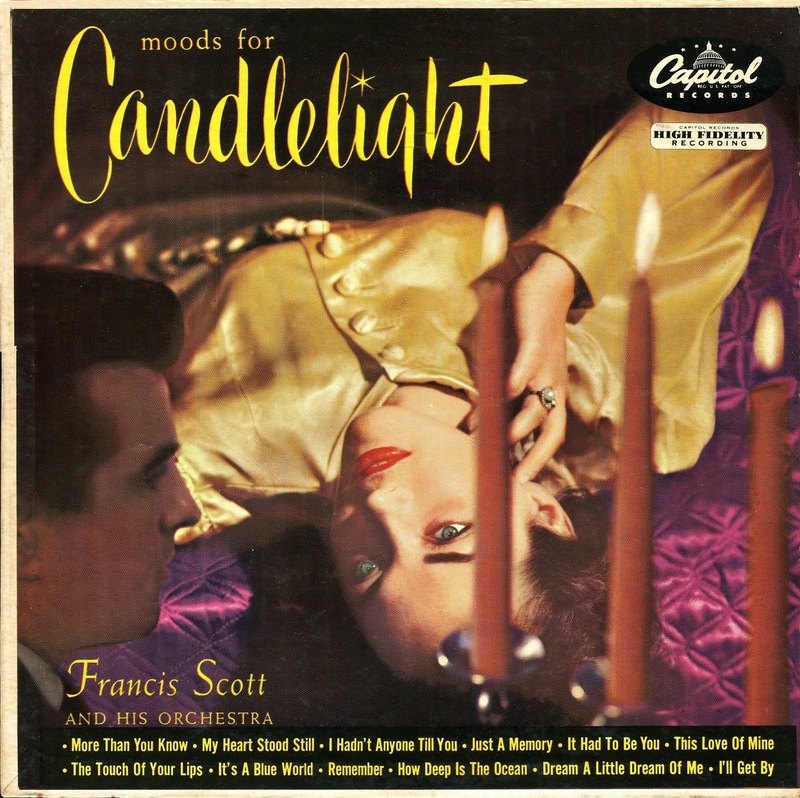 The orchestra belongs to Francis Scott (no Key), who was Artists and Repertoire man for Capitol, among other duties. As I noted, this is elegant, first-rate EZ (think Tommy Dorsey meets Andre Kostelanetz), but don't expect the tracks to remain in memory--none have in mine, anyway, even after three plays. They are background selections, after all. They set the mood, then they leave the room. This is a 12" reissue of the eight tracks from the 10" LP of the same name, with four tracks added from Moods for Twilight, Capitol L-331 (same year-1952). The label design on my disc identifies it as a 1960-1962 pressing.